Organized by: Mom Powered Media. Co-hosted by: Shannon's View from Here, My Dairy-Free Gluten-Free Life, Joans 5 Star Reviews, Sweetphi, Mommy Kat and Kids and Naturally Frugalicious. I love the holidays! I spend every year near the holidays crafting and baking gifts and treats for all of my friends. My oven is nearly always hot and my Kitchen Aid is whirring quietly in the corner. Do any of you have a Kitchen Aid? I love mine! It has a permanent place on my counter and I use it almost every day. I have a wishlist of items that I want for it, including the ice cream maker, the meat grinder and the juicer! Today, I'm teaming up with the MPM Network of bloggers to bring you this giveaway! MPM Network Bloggers are gearing up for an amazing holiday season. Make sure you stop by and checkout all the tasty recipes below. Surely you will find something that makes your holiday even yummier! 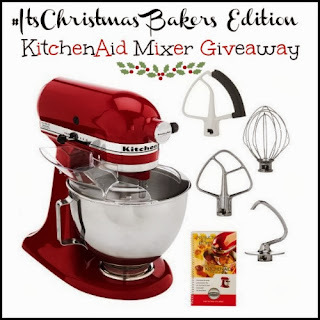 One lucky reader will receive a KitchenAid Tilt-head Stand Mixer + accessories! Giveaway ends December 9th at 11:59pm, open to US & Canada, ages 18+. To enter please use the Rafflecopter form below. Good luck. Disclosure:This Crafting Life is not responsible for sponsor prize shipment. Please contact teri@mompoweredmedia.com with questions or to see your business or blog featured on the next big event! Get all your Holiday Shopping done at Best Buy!! 50 Years of Doctor Who Giveaway!! Blogger Opportunity- Dr. Who Giveaway!! !